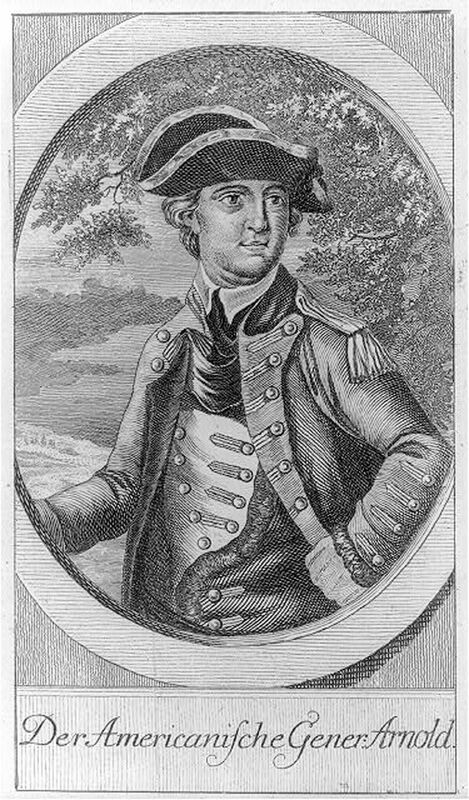 On September 24, 1780, American General Benedict Arnold defected to the British Army during the American Revolution. General Benedict Arnold led the Continental Army to pivotal victories at Fort Ticonderoga and Saratoga, New York. He is best remembered, however, for switching sides near the end of the war. On September 24, 1780, American General Benedict Arnold defected to the British Army during the Revolutionary War. Prior to his decision to switch sides, Arnold had a splendid career in the Continental Army of the young United States. His leadership was crucial in American victories at the Battle of Fort Ticonderoga and the Battles of Saratoga. Due to his success, Arnold was given command of West Point, New York, a fort that became the site of the future United States Military Academy. Unhappy with American leadership, Arnold began coded communication with British leaders to hand over West Point. When this plot was uncovered, Arnold fled to safety behind enemy lines, narrowly escaping American troops led by General George Washington. to arrange information into a system for communication. to abandon one idea or country for another. (1775-1783) conflict between Great Britain and the colonies that became the United States. Also called the American War of Independence. word that means the same thing as another. someone who betrays a person or idea. crime of planning to overthrow the government. (West Point, New York) federal academy for the education and training of U.S. Army officers. Also called West Point, USMA, or Army.